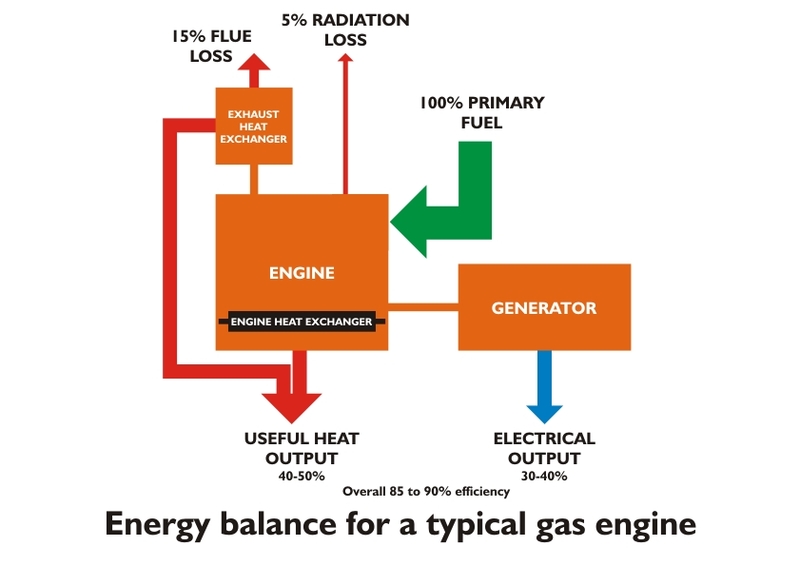 A combined heat and power (CHP) plant is capable of generating both usable heat as well as electricity simultaneously. Although gas or biomass boilers may operate with up to 90% efficiency, large coal, oil or gas stations only turn around 35-40% of their input energy into mains electricity; this naturally means a lot of wastage. 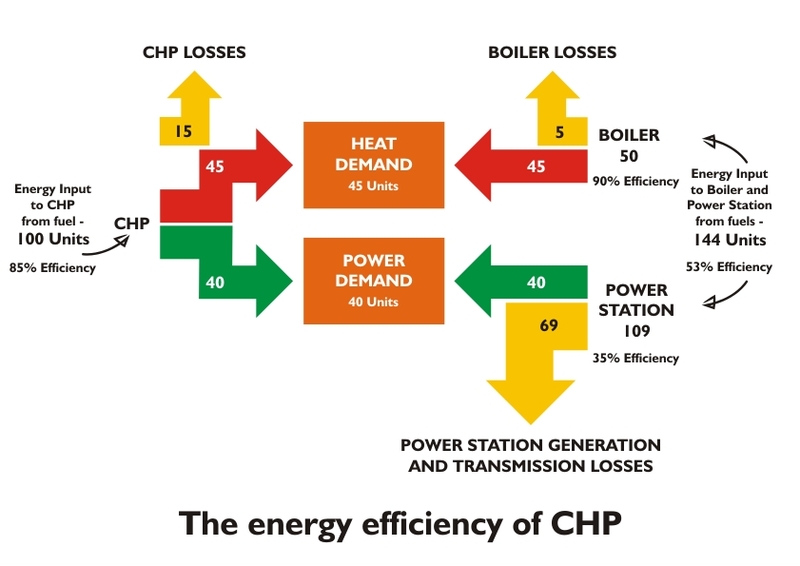 A commercial CHP unit however turns 60% of its input energy into heat and 30% into electricity giving an overall efficiency of around 90%. Gas CHP has become a well established and proven technology in the UK and Rural Energy partners with leading CHP manufacturers to provide this service. CHP or cogeneration is the highly efficient process of converting a single fuel source into both electricity and heat at the point of use. Fuel is burnt in an engine which produces low voltage (415v) electricity by turning a generator. Waste heat is captured from the cooling water and exhaust gases and injected into the localised site heating system at between 60 and 90 degrees centrigrade and if required, steam can even be raised from 7bar up to 16bar. Individual units can modulate their output between 50% and 100% to match the base heating load of a building. As a result end users typically see savings in the region of 20% to 30%. When is gas CHP suitable? Gas CHP units are designed to run long hours, ideally 16 hours a day and very often 24 hours a day. To do this the unit needs to be sized correctly to be able to supply the base heat and electrical loads. The CHP unit will operate automatically and can modulate but ideally needs to run at full load for as long as possible to maximise efficiency and minimise wear. 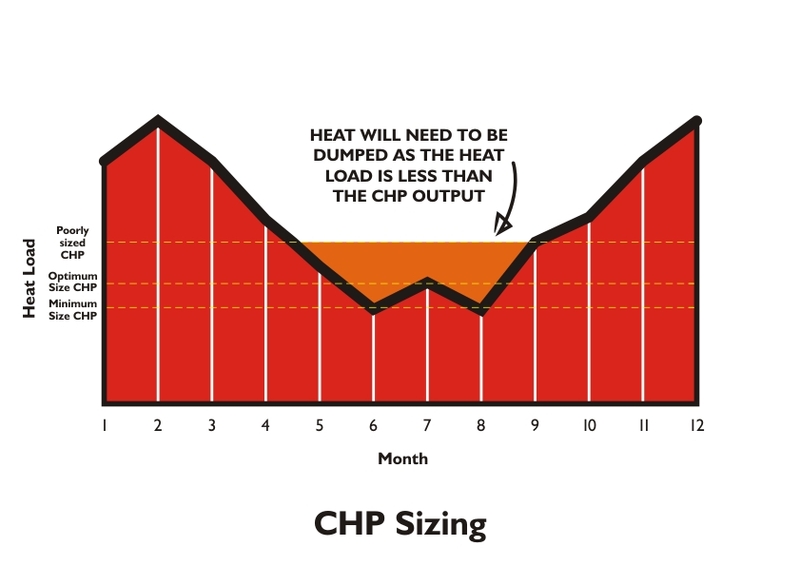 On some occasions the site heat load falls below the CHP heat output and when this happens the heat will need to be rejected. This part of the operation may not be eligible for the financial incentives. If the electrical site load drops below the CHP output then there are two possible outcomes depending on the localised conditions. The CHP power could be exported under a pre-agreed import/export agreement (however sometimes this may not be financially beneficial) or the other consideration is to modulate the CHP electrical output, to match the site load requirements so all of the site power comes from the CHP. Trust Rural Energy to deliver a turnkey solution that addresses your specific site needs from system design, to installation, and ongoing maintenance. We will develop a design that is sized to match your heat demand whilst ensuring you maximize the opportunity for cost savings. The CHP unit will be integrated to sit alongside your existing boilers but can be installed in a new dedicated packaged plant room if required. At Rural Energy we have a range of CHP solutions to match your heat and electrical requirements from 12kW electrical up to 2MW electrical. A CHP unit running for 16 hours per day for a year is equivalent to a vehicle driving 300,000 miles a year! A thorough and rigorous maintenance routine is essential to protect your investment. To ensure your plant continues to run efficiently you’ll be reassured to know that we can offer a choice of comprehensive maintenance programmes provided by our trained CHP engineers, including full remote monitoring packages with planned, pro-active and reactive services. Will CHP work for you?